This is the biggest threat facing businesses today—and yet most companies don't even realize it. After making huge investments of time, money, and energy in acquiring new customers, most companies see between 20-70% of those customers disappear in less than one hundred days—but we can help you put an end to that! 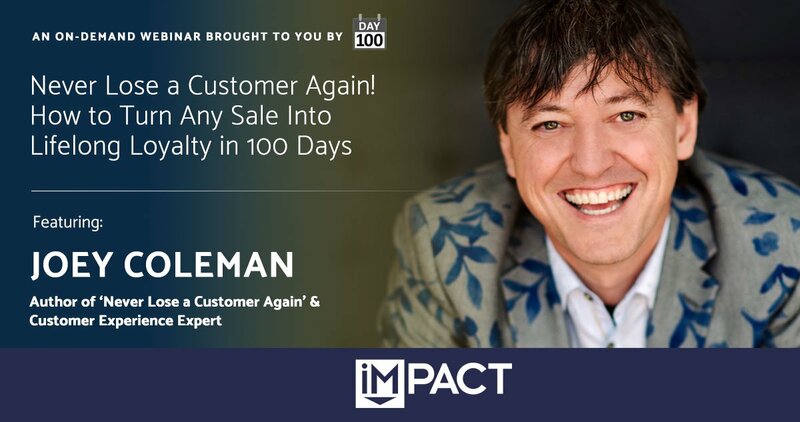 In this on-demand webinar, Joey Coleman, renowned speaker and author of the new book Never Lose a Customer Again: Turn Any Sale into Lifelong Loyalty in 100 Days (which debuted at #2 on Wall Street Journal's Best Sellers List! ), will introduce you to the First 100 Days® methodology—a new way of approaching your customer service and customer experience efforts that will turn new buyers into lifelong fans. Joey shares a proven road map for creating remarkable customer experiences that turn average customers into lifelong fans to drive your business forward in 2018 and beyond. The typical business Joey works with sees an increase in profits of 25-100% and an increase in customer referrals of more than 30%, so don't miss out! Whether you’re B2B, B2C, just starting out, or have been operating in the customer experience space for decades, this entertaining and actionable presentation gives you the tools you need to transform customers into powerful advocates for your brand. Speaker and Author of "Never Lose a Customer Again: Turn Any Sale into Lifelong Loyalty in 100 Days"
Joey Coleman helps companies keep their customers. An award-winning speaker, he shares his First 100 Days® methodology for improving customer experience/retention with organizations around the world (e.g., Whirlpool, NASA, and Zappos). His book Never Lose a Customer Again shows how to turn any sale into a lifelong customer. Fill out the form, and you'll gain access to the recording and slides from the webinar!